Bright Matrices | Writings & musings of Mike Zavarello (a.k.a. brightmatrix), a "red mage" web developer. When it comes to the workplace, I’m a very apolitical person. I’m not talking conservative vs. liberal; I’m referring to to the interpersonal shuffling for exalted status that exists in pretty much any corporation. You may know these folks as glory hounds: those who are primarily (and often obsessively) concerned with their standing, status, and visibility among their supervisors and their peers. Glory hounds play this intricate, interlaced game of politics to push through their own agendas and build their legacies. 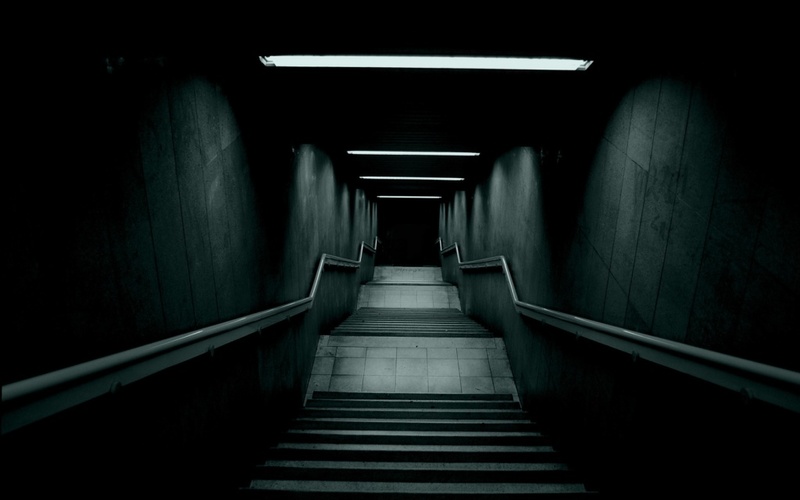 Sometimes it’s intensely obvious; most times, it’s subtle, like a faint vibration in the floor. So long as the games of the glory hounds don’t intersect my world, I can live with it. However, once my time, my projects, and my (and my team’s) reputation come under (direct or indirect) assault by a glory hound’s agenda, I start to seethe. I don’t like these games. They frustrate me. Over the past year, I’ve been working my way steadily through the Old Testament to become more versed in God’s word. I’m currently in Job. If you’re not familiar with this book of the Bible, Job is a “righteous and blameless man” whose family, livelihood, and ultimately, his health, are taken from him to showcase his steadfast obedience to God. Throughout the book, several of his closest friends come to counsel him, assuming that some sinful act of his has let to his current state (and obviously not being terribly helpful). Job replies back to each, increasingly frustrated, fearful, and confused with God, but never once vilifying or defying Him. Job finally gets to plead his case to God directly, but that’s not where I’m going here. This last verse is what got me. In reading this passage, I saw that the glory hounds can have their “long-winded” and “fine” speeches; they can push their agenda past, over, and through my working life. I, however, can make the choice to do better, through kindness, empathy, and encouragement. I don’t have to play along, or even to “play nice.” I can choose to be uplifting and even-keeled (“authentically nice”) in my actions and my reactions. It’s tempting to push back against the glory hounds, to slander them, to gossip about them, and to frustrate their plans out of spite. But I believe I’ve found a method of coexisting with them in a manner that will truly uplift those around me in the workplace while stripping away emotions and thoughts that are simply mental clutter. To quote the famous line from Wargames, “the only winning move is not to play.” I won’t play the games of the glory hounds, but instead I can walk the high road with humility, and truly live it. “Never read the comments” … and product reviews? Over the weekend, I had a thought regarding the Internet age adage “never read the comments” and product reviews. Aren’t reviews, in a sense, comments on a product? If we’re advised by the wise sages of the internets to not read them, how are we supposed to make what we feel as educated decisions on something that’s going to cost us time, money, or both? I most always read the comments, or, at least the first few of them. Why? It’s the commentary, y’all! In enough cases to warrant reading said comments, I’ve found enough enlightenment and details in back-and-forth discourse between commenters (and more fun if the original poster or author chimes in) to enrich the article, essay, diatribe, etc. The glaring exception is YouTube videos, which are riddled with spamvertisements. I also use comments as a bellwether of the source document’s tone and agenda. You can tell a lot about an article by what chatter it stirs up in the digital pot, such as its reputation, its readership, and its (though I’ve grown to dislike this term) authenticity. As a general practice, whenever I see product reviews for something on, say, Amazon, I go and read both the “most recent” and “most helpful” sets to get a general consensus. “Most recent” tells me whether there are problems or improvements that may affect my decision to buy this product. You see this a lot on the Apple App Store when a particular app pushes out an update. In that regard, low ratings due to past grumbling about quality or performance may now be fixed with a new version. It could also tell me whether the product has consistent problems back through time. I take the “most helpful” reviews with a mighty strong grain of salt. There’s been quite an influx of “professional reviewers” getting paid to “gloss up” a product’s overall rating, and that unfortunately muddies up the waters. Professionally-written reviews are not always explicitly marked as such, but they always seem to have the same glossy platitudes in their writing style; they’re all trying to tell (or sell) the same story. Here’s the flip side: I find that too many reviews are full of “complaint noise:” users or consumers who have no effective way of getting to the manufacturer or creator other than posting negative reviews, or, those who are confused or ill-informed about the proper use of what they purchased. A good example I found just the other day is the Disney XD app for iOS, which I downloaded to watch the latest episode of Star Wars Rebels. A good percentage of the reviews were low- or one-starred. The 10 most recent reviews seemed to be written by a lot of tweens and teenagers looking to stream Disney XD shows but getting deflected by an internet service provider login or parental restrictions. Having an ISP and being a parent myself, I don’t have those obstacles and, as a result, their experiences aren’t reflective of my own. In this day and age, it’s good to see differing perspectives and opinions, so long as you, the reader, have the discipline to read objectively, not get pulled down in the abyss of petty arguments or controversies, and dive no deeper than page or two of the paginated results. “Don’t give in to hate,” as Master Obi-Wan Kenobi once said. I’ve become an avid note-taker over the past few years of my career, recording and documenting webinars, conferences, and workshops as fast as I can key. Once I’ve had a chance to smooth out my transcripts, I enjoy sharing them with my colleagues so they can benefit from what I observed and learned. The act of note-taking is also an effective way for me to commit things to memory, which means I’ll walk away from a panel or workshop with a stronger understanding of what was shared. What I’d like to share with you all today, however, is not the notes I take, but how I take them. I call it my “laptop in miniature” setup. Being a web developer by trade and a passionate user and advocate for social media, the conferences, events, and workshops I attend all fall into the technology, marketing, and user experience sectors. These events are usually heavily attended and sparse on room. Keynotes usually take place in lecture halls with stadium seating. Panels and roundtable discussions can often be found in cramped rooms with rows upon rows of chairs all packed together. Depending on the venue, there’s few opportunities to pack up all of your belongings and find a comfortable and roomy spot in the next session. Thus, I’ve learned to travel light and have a modest setup for taking notes. I find laptops uncomfortable to use. The screen is rarely at an optimal angle in tight conference halls and the heat from the air vents makes me feel like a slowly roasting marshmallow. Tablets are awkward for me to type on and a challenge to balance without a hard surface. 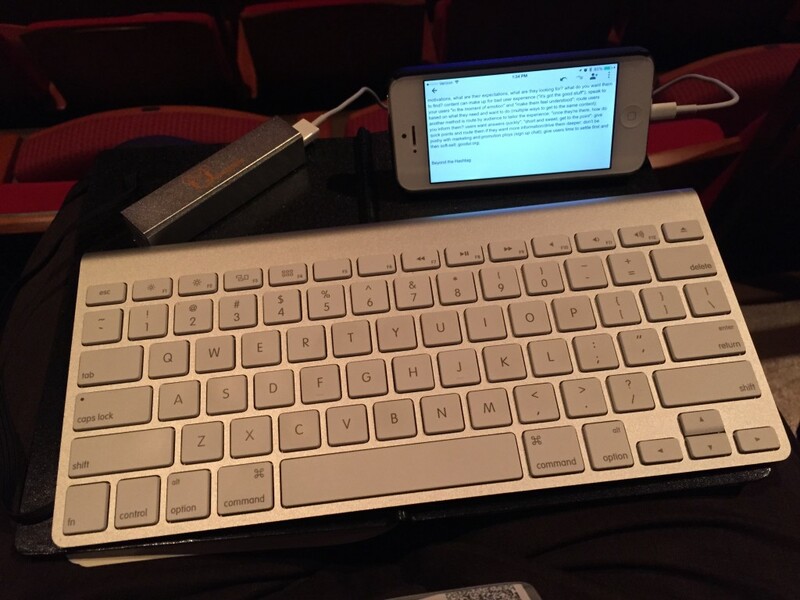 My solution is my trusty iPhone, a phone case with a kickstand, a portable power source, and Apple’s light and sturdy wireless keyboard. The case I’m using is made by Aduro (here’s a link to the iPhone 5 version). It has a slim form factor (not at all bulky like the Otterbox armored cases) and the fold-out kickstand allows me to stand the iPhone straight up or on its side. The price is also super-reasonable: Amazon carries them for around $12. The portable backup battery is my newest acquisition (thanks to the good folks at Swagchimp) and has become a valued member of my technical arsenal. Twitter’s iPhone app is very hungry for battery power, so having the ability to keep at full strength if outlets and power strips are out of reach is invaluable to me. I can’t sing the praises of Apple’s wireless keyboard enough. It’s modest size, light aluminum frame, and quiet keys are ideal for fast breakdown and setup between sessions. The Bluetooth connection is highly reliable and its consumption of battery life is minimal. It is without hesitation the best $70 I’ve ever spent on technology. My only non-tech concession is a folded-out, hard-backed notebook to serve as a level surface for the entire setup. That packs up nicely as well and can help for sketching out wireframes and concepts, as needed. I’ve written before about the slippery slope of careless comparisons, and how one can never expect to keep up with a curated life. 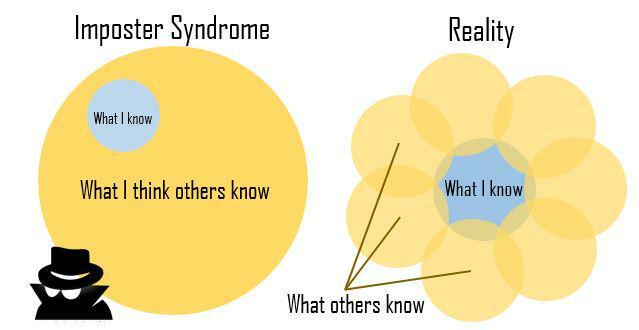 Still, I’ve found it exceptionally difficult to shake off the cloak of inferiority that comes with imposter syndrome. Because folks are curating the highlights (or lowlights) of their lives, you never see the whole picture … mostly, the mundane middle stuff that is the majority of what makes up a person. Awareness of my mundane moments is what I feel contributes strongly to the feeling that I’m not worthy or deserving of the things I have, say, or do. This is a classic fool’s errand! If everyone else presents themselves as polarized highs and lows, of course they’ll seem so much more talented or deserving than me. That’s why I found the following diagram, which was included in that tweet, so illuminating. It really nails down what I feel versus what’s really going on. I’m not some subset of someone else. I share an overlapping set of attributes, beliefs, and talents. The strengths and depths of where we overlap can and do differ, but that doesn’t diminish who I am or who you are. In role playing games such as Dungeons & Dragons, you roll a 20-sided die to determine how well you accomplish an action, goal, or task. A higher number yields a better result. A roll of 20 is called a “critical hit” or “critical success,” and is usually accompanied by an extra bonus for doing an amazing feat. 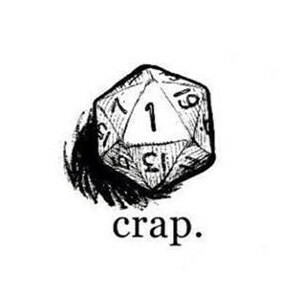 A roll of 1, on the other hand, is a “critical failure,” which produces a “comedy of errors” type of result (your character trips, drops their sword, etc.) that simply wouldn’t happen if you merely rolled lower than necessary for a successful outcome. “Fear of critical failure” is drawn from, and stacked upon, my misguided sense of imposter syndrome. As a self-perceived “imposter,” I’m already running the risk of being “unmasked” or “found out” as inferior or unskilled. Add the fear of a critical failure into the mix, and it’s all paranoia and madness. It can range from the vital (fear that I missed a critical step in selling a house) to the ordinary (fear that I’ll botch an opportunity to get a better deal on my cable bill). It’s made me risk-averse, and, frankly, a bit of a coward. I’ve missed chances to save money, fight for my convictions, and be a good example for my family. And so, finding this message on Twitter has been so immensely helpful as a reminder … and as a mantra. First, writing is therapy for me. Getting my thoughts organized into a coherent structure, like this essay, helps me better sort out the mish-mash in my head. When I can better identify what’s swirling around inside, I can formulate a plan of attack to prevent these thoughts from affecting my daily life. It’s also helpful from a personal accountability aspect. When I choose to make something public, it’s harder for me to simply ignore my problems and retreat into old habits. Second, it’s the hope that I can help someone who’s struggling with similar issues. I’ve come to believe that each of us has purpose in life … not just a singular, overarching objective, but many overlapping reasons for being that connect us to others, whether we realize it or not. Also, finding out that you’re not alone in your struggles is undeniably helpful. I have a very bad habit of not reaching out for help, whether that’s family, friends, or faith, so I want to do what I can to ask for help on a regular basis, even if it’s just the hope that someone will read this and connect with it … and, in turn, help someone who may not know how to ask themselves. Thanks for taking the time to read this today. Author’s note: If either of the images shown in this essay are yours, or you know whose they are, please let me know and I’ll be happy to give the proper credit that’s due.